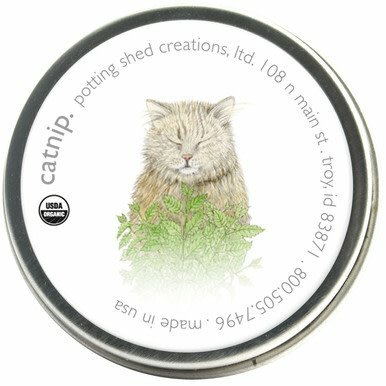 Organic Catnip (Nepeta cataria) A member of the mint family, catnip attracts cats domestic and wild. Even lions are sensitive to the oils in the stems, leaves and flowers. Catnip has long been used as a seasoning and to make calming teas but was first cultivated for its effect on cats. If fresh, the leaves and stems need bruising to release their oils or you can dry and crush them as a special treat and to help relieve boredom. Includes: organic seed, reusable recycled US steel tin, ribbon hanger, directions. Tin 2" diam.